Just over a week after learning that their license fees could soon be rising dramatically, the city's patio owners got another surprise Wednesday: new restrictions on their sidewalk spaces are on the way. The new measures, which would push back some patio frontages to make room for people with disabilities and pedestrians, came up at city hall's Disability Access and Inclusion Advisory Committee meeting Wednesday. 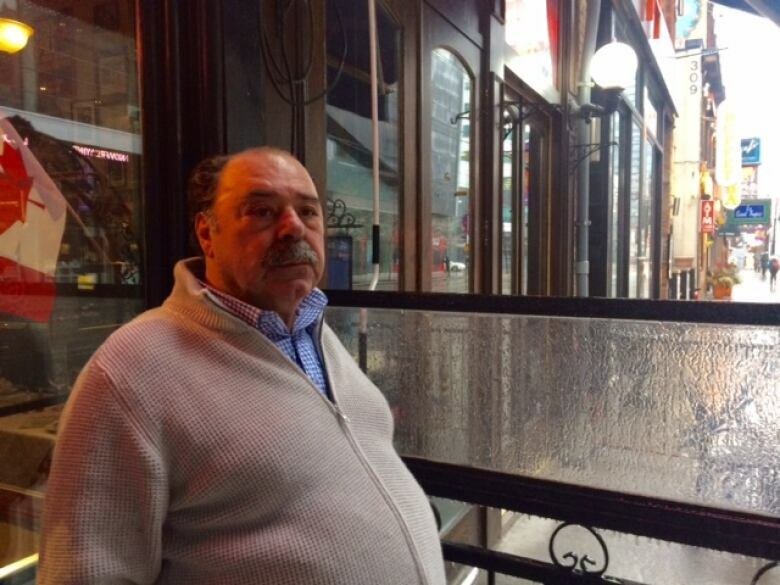 "This would kill me," Al Carbone, owner of the Kit Kat Italian Bar and Grill on King Street West, told CBC Toronto. "It just doesn't stop. It gets worse to do business in this city." But advocates for people who are disabled welcomed the move to create clearer public passages. "If you can't get down the sidewalk, you can't live," said Wendy Porch, who sits on the committee. "You can't get out; you can't be part of your community." 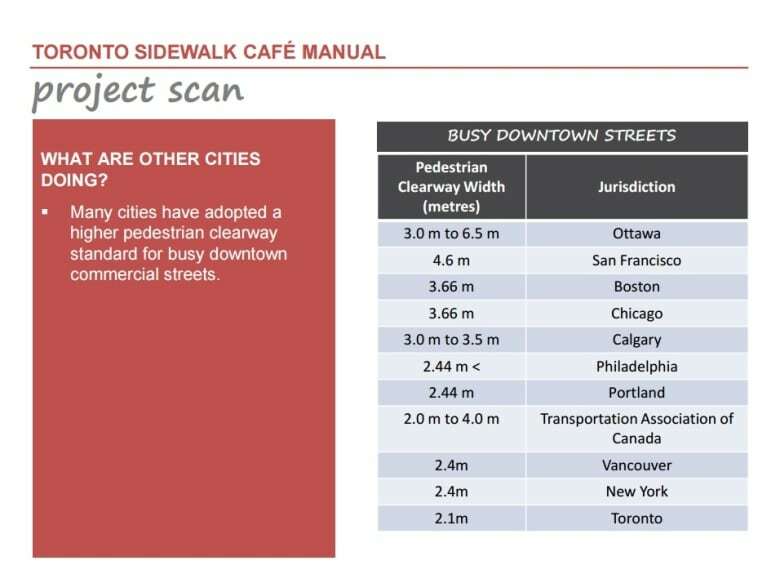 The committee was shown a new draft plan by transportation services that suggests the city enforce a 2.1-metre "clearway" for pedestrians and people with disabilities on main street sidewalks, and 1.8 metres on less well-travelled roads. Although the minimum 2.1-metre clearway has been on the books for some time, the committee heard, not all patio owners have complied, and staff say they should be brought into line. "Our current proposal is that [the clearway standards] be applied to existing permit holders," Chris Ronson, a project manager in transportation services, told the committee. "Our intention is not to gut or savage the cafe culture out there. We want to be respectful of that." And he said the city should help existing businesses adapt to the measures in the manual, which will define for the first time how and where all storefront businesses can encroach on the sidewalk. Ronson emphasized that the draft manual before the committee is not carved in stone and that discussions with restaurant owners and business improvement areas are still going on. The manual is expected to be finalized in 2018. He suggested giving patio owners on main streets two years to comply with the measures in the new manual. And if bar or restaurant owners are forced to move their patio fences back from the roadway under the new rules, measures are being researched that could allow them to expand in other ways to make up for the lost square footage, the committee heard. For instance, one of the new measures would allow patios to spread to the left or right, in front of neighbouring storefronts, provided those business owners agree. The draft plan also suggests that owners could set up outdoor serving areas on adjacent parking spaces, or at the curb, out of the main flow of pedestrian traffic. "We're hoping to design our way out of this," Ronson said. But Coun. 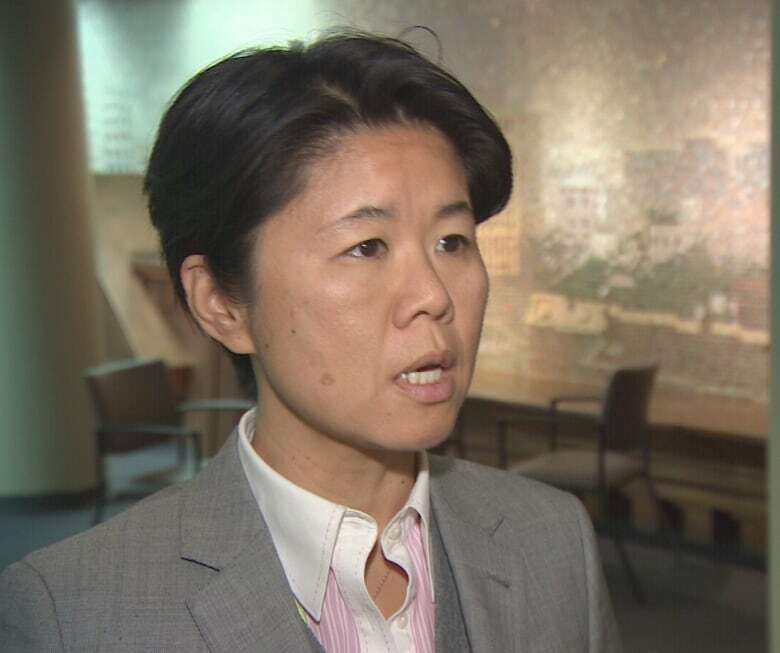 Kristyn Wong-Tam (Ward 27, Toronto Centre-Rosedale), who chairs the committee, later asked staff to look into the possibility of making that standard clearway even larger. She said most other North American cities have reserved sidewalk clearways that are far broader than Toronto's 2.1 metres. She said in some of the higher traffic, more congested pedestrian areas — for instance, sidewalks near subway stations — the clearway should be wider than the standard 2.1 metres. "Commercialization of these public spaces is not a constitutional right," she told CBC Toronto. "They don't pay rent for the sidewalks." 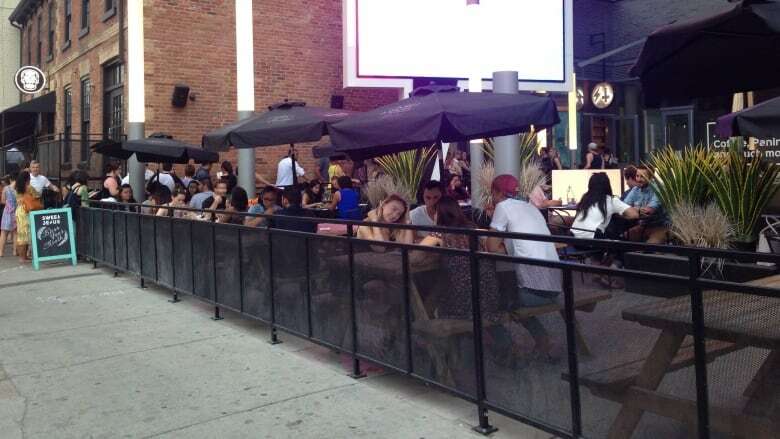 According to the city's numbers, there are 728 licensed patios in Toronto.